Owning a car means that from time to time, you will need car repair work done. Usually the older the vehicle, the more repairs need done as things ware. Properly maintaining your car can help reduce the need for repairs, like regular car servicing. 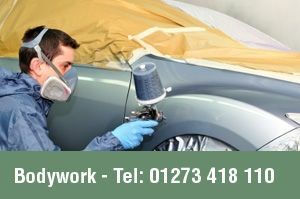 Palmeira Bodyworks carry out a variety of expert Car Repairs in Brighton. Brake repairs are one of the most common repairs that need to be carried out. As your vehicle ages, brake pads and brake discs need replaces. Your brake fluid may also need changed over time. You should roughly get your braking system checked every year, or every 10,000 miles to ensure they are running correctly. Changing your oil is essential to all car owners. Getting your oil changed frequently is a must, it will keep your car in its best working condition. It will also lengthen the life of your engine and avoid further damage to your vehicle. This can be done separately, or as part of your car service. Tyres are something that you always need to keep an eye one. It is important that they have enough air, and the thread depth is within the legal limit. From time to time, as they ware you also need to replace your tires. If one becomes damaged it could be repaired or replaced. It is common for tyres to become damages, for example driving over a nail/sharp object. It is important to keep an eye on your car lights. Like your lights at home, bulbs can blow at any point. If your brake lights are broken, you could receive a fine and even penalty points. It is important to keep an eye on all of your lights, including your headlights to make sure they are all working as it can be dangerous, and cause an accident. When you notice one of your lights are blown, take your car to a reliable garage to get fixed. Other common repairs include coolant system issues, fuel system repairs, exhaust repairs and ignition repairs. If you are experiencing any of these issues or another that isn’t stated, make sure you get your vehicle checked to avoid further damage. 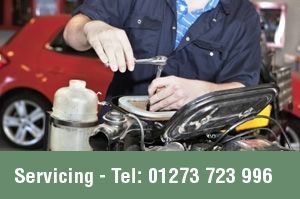 Palmeira Bodyworks & Servicing are experts in Car Repair Services in Brighton. Don’t hesitate to get in touch with any problem you may be having. We can offer a high quality service at excellent rates and even a courtesy car. Call 01273 723996 to find out more or fill out a contact form. We would be more than happy to help get your car into working order.